Rub the Smoked Black Tea Rub all over both sides of brisket. Heat olive oil in a roasting pan over medium-high heat; place brisket in the hot oil and brown on both sides, 3 to 4 minutes per side. Remove brisket from pan and set aside. Place the onion slices into the hot roasting pan and cook and stir until onion is slightly softened, about 2 minutes. Stir in beef broth, tomato sauce, and wine. Place the brisket back into the roasting pan and cover pan with foil. 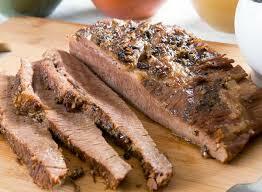 Roast the brisket in the preheated oven for 1 hour; remove foil and baste brisket with pan juices. Place foil back over roasting pan and roast brisket until very tender and pan sauce has thickened, 1 1/2 to 2 more hours.